Being hit by the news that your friend, lover or comrade was an undercover officer can be shattering, yet it is through this news that the spycops scandal broke and we have become aware of the appalling abuses committed by these officers and the units behind them. 19 undercover officers have been identified so far but it is thought there have been over 200 operating since the SDS was set up. Each officer had a name they used while undercover, and it is these we are demanding that the Inquiry release, so that the people affected can give their evidence to the Inquiry, and the true extent of this scandal is exposed. The Inquiry has released confirmed the names of a handful of officers so far, but these were all ones already identified by campaigners. Why must the cover names be released? The lessons from Germany during the fall of the GDR are clear: legal processes, courts, and government inquiries alone cannot be trusted to uncover the truth. It took direct action and pressure from the grassroots to forcibly expose the abuses of the Stasi. Today…. we remember the bravery and conviction of the people of the GDR; and to the police and the Pitchford inquiry we have this message: enough is enough, it is time to release the cover names and open the files.” Statement made by eight women suing the police over relationships with undercover officers. In a letter to Lord Pitchford, 133 non police, non state core participants explained that in order to be successful, the Undercover Policing Inquiry must release a list of names of all the organisations about whom intelligence was gathered and the cover names (not the real identities) of the individual officers responsible for infiltrating and reporting on activists and campaigns. Without this basic information, it is impossible for the Inquiry to have a full picture of undercover policing. The only people currently able to contribute to the Inquiry are those that who have already themselves researched and revealed the existence of undercover officers, or those who have been informed by the media they had been subject to covert surveillance. This means the overwhelming majority of individuals and organisations targeted since 1968 have had no opportunity to consider the possible consequences of the actions of undercover officers and cannot currently participate in the Inquiry. By their own admission, police records were patchy and much of what was documented has subsequently been lost or destroyed. Even without the resistance to genuine openness and transparency we are experiencing, it is plain the police alone cannot provide an adequate narrative of their actions. The only way to discover a true picture of the impact of their undercover operations is to hear the testimony of those about whom intelligence has been gathered. Though it is a public inquiry, Pitchford has power to restrict attendance at hearings and the release of some evidence. These are known as ‘Restriction Orders’ and applying for restriction orders on cover names are how the Police are trying to keep them secret. Pitchford made a ruling on the approach he would take to restriction orders and anonymity (see progress briefing 1). His ruling was tentatively promising, recognising the chilling effect not releasing cover names would have on the Inquiry, however he plans to undergo a balancing exercise for each application for a restriction order he receives from the Police. In January, Pitchford set out a timetable for restriction order anonymity applications, but it has experienced significant delay and they many are not expected to be dealt with until 2018. The police seem to be deliberately delaying the process. It is expected that the police will apply for restriction orders for almost all the officers and many backoffice staff and supervising officers as a way to delay the proceedings. 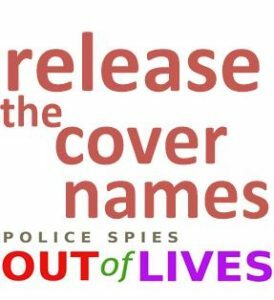 The police will claim that there is a risk that officers will be harmed if their cover names are released, but there is no evidence of that, with nearly twenty officers having had their cover names exposed by activists.